IPVanish is a multi-award winning VPN service with hundreds of servers throughout the world. IPVanish offers all of the standard features of your typical VPN service provider, but offers greater speed, selection, and reliability than most others. IPVanish has their own Tier-1 network to enable the fastest speeds on the market. If you are looking for something reliable and fast with no hassle, look no further than IPVanish. IPVanish can be purchased at a month per month basis for $10 or if you purchase for the entire year you will only pay $6.49/month. IPVanish has a simple and to the point website. It is refreshing to have all the information you need as soon as you log in without having to search for valuable information. Once you are logged into your client account, you will have four main options. One of which is viewing the extensive server list (so extensive that it cannot be listed on a single page). 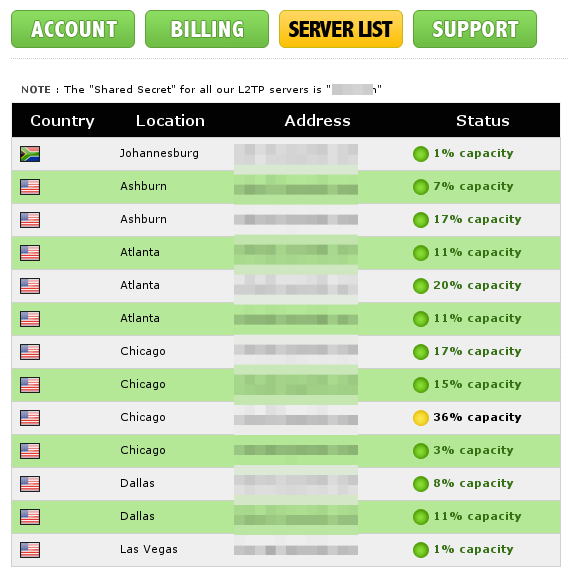 Something that sets IPVanish's server list apart from others I have seen is that the capacity is listed. This is useful for the end user in deciding which server is best for their particular location. To add further convenience, all of the links to the configuration files are available when you go to the server list. There were too many servers for me to bother counting from IPVanish's website. Let's just say, IPVanish is a big player with many servers all over the world. One particular thing that I would like to mention about the software that I have not seen from other VPN providers, is that you can sort the server list by connection time from your current location. This was useful for me. Here in China I typically try to connect to Hong Kong or the West Coast (US) but after sorting the trough the list using the Windows software I was able to find other servers that offer comparable speeds to that of Hong Kong. As you should expect from a big VPN player, reliability and speed are not issues you need to worry about. I have had not problems with either. I have been running IPVanish from my DD-WRT router and have not had the need to reset the router or change servers. Great reliability and speed (IPVanish has their own Tier-1 network). Constant improvements and new features. Website does not work in China (without already using a VPN or proxy). If you are looking for a VPN service that you don't have to constantly fiddle with, then IPVanish is the way to go! It just works. Try out IPVanish today! IPvanish is one of the VPN Service Providers that is renowned and popular VPN and has remained a favorite among internet users for a very long time. Even though, IPVanish VPN has only recently started providing VPN services, it has become a household name in this field in a very short period of time. When it comes to speed testing, IPVanish does not affect the upload time, but decreases the download speed by about 50%. I have been using IPVanish for over 6 months but I never had any issue with speed. Here you can see speed tests there is no big changes in uploading and downloading. I've been using IPVanish for everything from unblocking to streaming videos. Perfect speed and reliability and a very user friendly interface. Great stuff! Agreed. Just to provide a counterpoint here, I used IPVanish android while on business in China and it was excellent. I never attempted to contact support, but the connection was always quite good. Could I get access to my gmail account through IPVanish? Absolutely. Having a VPN before you go to China is a great idea. I would probably download Freegate on a USB drive as well for backup. Something else that I have done is forward all my incoming email to another account like Yahoo for an additional backup.